A $250 million investment will see Windstar Cruises stretch its three Star-class motor yachts, adding capacity for 100 guests to each ship while re-engining them to be more fuel efficient at the same time. “It’s quite simple, we were looking at more traditional ways to expand capacity in a newbuild, and this is something that is not uncommon in the industry, and financially it makes more sense,” said John Delaney, president of Windstar, in an interview with Cruise Industry News. The 1988-built Star Breeze, 1990-built Star Legend, and 1988-built Star Pride will enter a Fincantieri shipyard in succession between October 2019 and November 2020 for their lengthenings, dubbed the Star Plus Initiative. Each vessel will then emerge with capacity for 312 passengers, up from 212, boosting capacity for the Xanterra Travel Collection brand. The ships will be cut in half with a new 25.6-meter-long mid-section added to each vessel over a four-month window. The ships will also get new engines. On the powerplant side, changes will happen as the odd seven-engine configuration in each vessel will be re-done with four new engines. Delaney said the added capacity, 24 percent, lets the Seattle-based line offset higher fuel and fixed costs against 100 more guests on each vessel. “From a math, pure ROI (return on investment) perspective, it is clearly the winner,” he noted. The ship stretch and refurbishment also allow Windstar to add new areas, upgrading public rooms, adding restaurants, and expanding the fitness and spa area. Plus, all staterooms will get new bathroom units. The ship stretch will also allow the company to add capacity quicker than going with a newbuild. Can they fill the additional rooms? Planning started in March 2017, both for a newbuild project and the stretch project. Having completely redone its deployment with over 150 new ports, Windstar has opened the map, and the Star-class stretch jobs will help build on that. When done, the ships will be some four knots faster at service speed while burning less fuel, allowing the company to get even more creative with its deployment. More fuel efficient engines combined with more capacity and freshened look driving ticket pricing should deliver a short pay-off period, with a conservative Cruise Industry News estimate of five years per vessel. 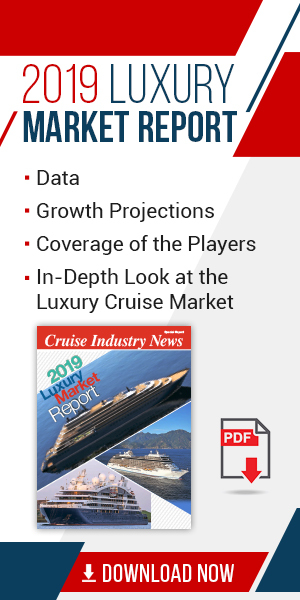 The booming refurbishment and drydock market is worth an estimated $3 billion in spend annually, according to Cruise Industry News estimates.